As we saw last week with the announcement of the Global Findex 2014, more women and men have access to formal financial services but the gender gap persists. At Women’s World Banking, we are often amazed to be present at events where financial inclusion is discussed and the opportunity to address women’s needs isn’t addressed at all. This is a severe oversight that has tremendous implications for global economic development and prosperity. There are 2 billion adults globally who are “unbanked,” meaning they do not have formal accounts with financial institutions. Most of them are living in the developing world. And, according to the World Bank, “access to affordable financial services is linked to overcoming poverty, reducing income disparities, and increasing economic growth.”  The incredible potential for positive impact that banking the unbanked brings has inspired a host of new players – commercial banks, technology companies, and mobile network operators to go beyond credit to offer savings, insurance, pensions, and remittances. And the investment these players are making is working. According to the recently released Global Findex 2014, the numbers of adults with bank accounts worldwide has risen by 700 million people since 2011. Now more than ever, low-income people in developed and developing nations worldwide have access to the basic financial services that many of us take for granted. There is, however, concern in these numbers: while the financially excluded population has dropped, the gender gap has not shrunk. And that is why Women’s World Banking is introducing the “#BankOnHer.” Our goal is to remind our allies and supporters that financial inclusion must include the one billion women that don’t have access to basic financial products and services. The current interventions are working, but mostly for men. But women, who face more barriers to access, such as lack of mobility due to cultural or social norms or institutionalized gender biases in regulation, are being left behind. 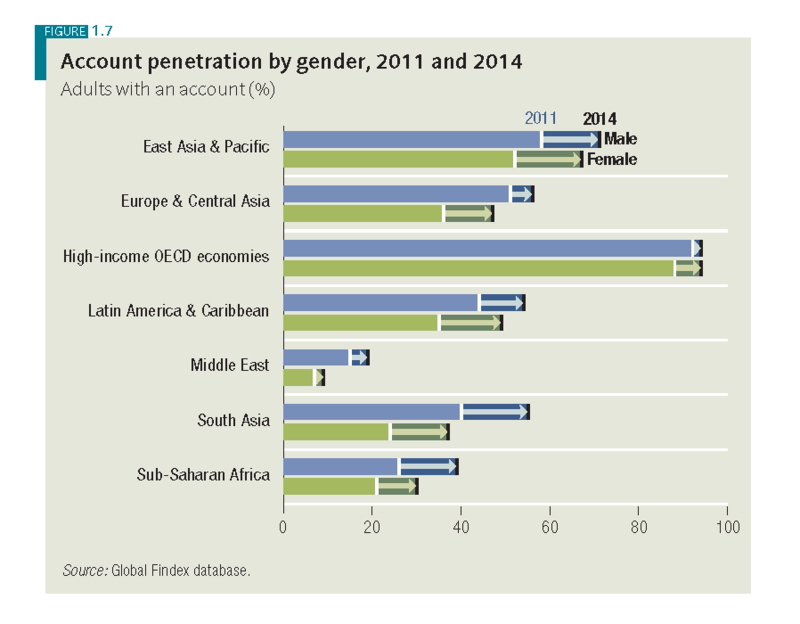 Indeed, “in developing economies women are nine percent less likely than men to have an account at a formal financial institution.” And the gap is greater in some regions – women are half as likely as men to have an account in the Middle East. A woman with a bank account can be a loyal bank client. A woman with a savings account can save for her children’s education. A woman with health insurance can protect her business in times of crisis. A woman with a loan can build her business. A woman with financial education can determine her own future. Financial institutions also benefit from serving women. For years, Women’s World Banking has argued the business case for serving women – apart from being an incredible market opportunity, our experience has shown that women clients are good for business: they are more loyal clients, they repay their loans more consistently and are more likely to take up multiple products with a financial institution. But also, a woman served with financial services can do so much for the global economy: for instance, according to estimates by Goldman Sachs, giving women-owned SMEs access to credit can boost real income per capita growth rates* by around 85bp on average. A woman with a bank account can do so much. But too many women are excluded from financial services. And we are all the worse for it. The persistence of this gap is especially why we must bank on her. But as we have just shown, there are a billion other reasons to bank women. So tell us, no, tell the world, using email, Twitter, Facebook or even better, face to face. Why should we #BankOnHer?